Temporary hair color touch-up comb for roots and all over the head. Color slab is already affixed to the comb and must be moistened with warm water. It is then combed through the hair and allowed to dry. 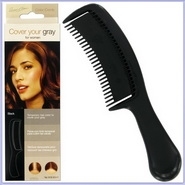 DIRECTIONS: Dip comb in warm water and run through roots or the gray areas you wish to apply color to. 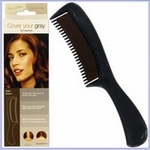 Allow hair to dry thoroughly before you use your own comb or brush to blend the applied color. Temporary hair color. Shampoo normally to wash out.